Joschua made this nice depiction after we had an interesting discussion about the possible life-appearance of Nanuqsaurus hoglundi, a small tyrannosaurid from the late Cretaceous which was found in the Alaska North Slope. Nanuqsaurus nearly certainly experienced quite cold climates on occasion and had to deal with bad weather. Joschua made his Nanuqsaurus reminiscent of a giant petrel (Macronectes giganteus) (earlier covered here), a very large antarctic seabird with very nasty eating habits. 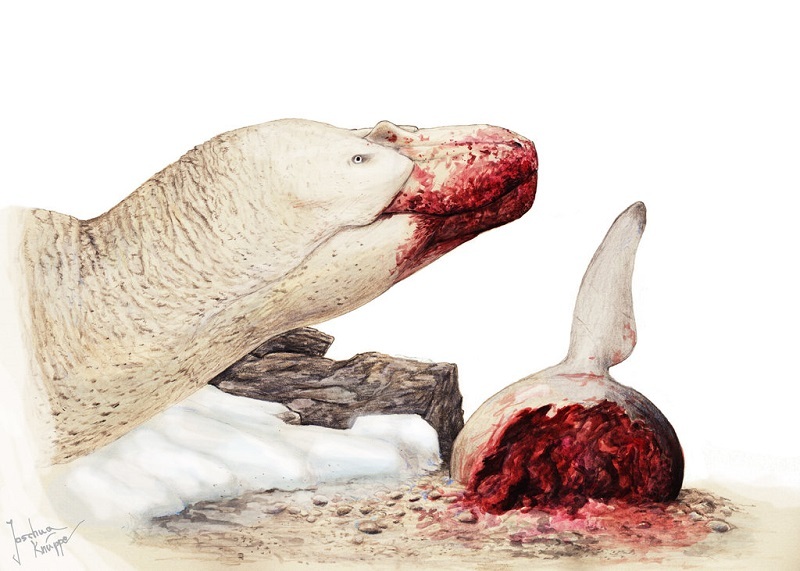 And like giant petrels, which have their heads often fully covered with blood when they scavenge on the carcasses of dead seals, this Nanuqsaurus has its mouth and snout also smeared with the blood of a dead mosasaur it found washed ashore. It looks also suprisingly similar to this komodo dragons feeding on a dead dolphin, despite the dirty whiteish plumage. Dieser Beitrag wurde unter Dinosaurier, Paläontologie veröffentlicht. Setze ein Lesezeichen auf den Permalink.